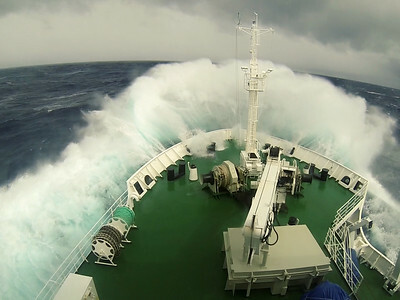 In the middle of the night we were rocked awake as we entered The Drake Passage. In the morning this was the scene, an angry sea. 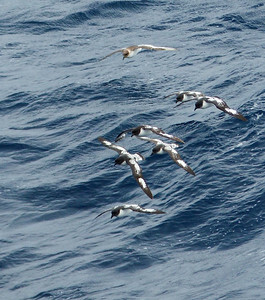 The Drake Passage: It's not so bad, until it is. The Vavilov meets the full force of The Drake. 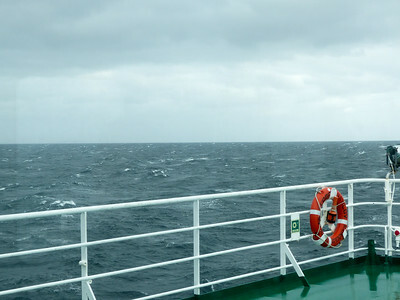 On the Beaufort scales this was considered a "strong gale" at 40+ knots (9 out of 12) and "heavy swells" up to 7 meters (7 out of 9). 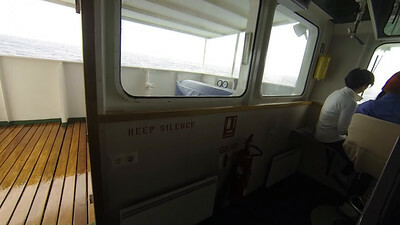 About a third of the passengers were not seen for the entire crossing and another third had shades of green. 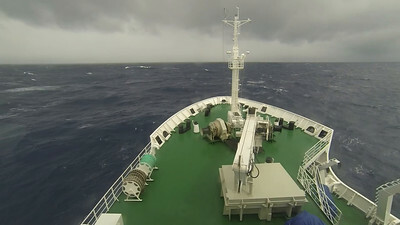 I ventured out on the port fly deck to get some unobstructed video and to show the port side list due to the wind. I didn't know I was going to be out there for one of the biggest swells! 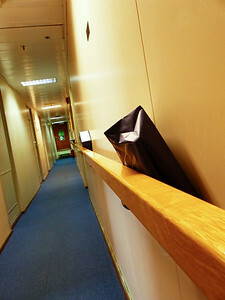 Seasick bags strategically placed along the hallway _just_ in case one had a sudden urge. 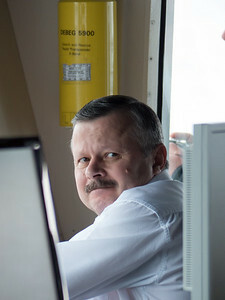 The captain and crew of the Sergey Vavilov were awesome. 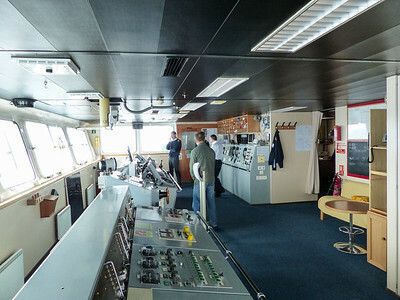 They did their job with no fuss or muss and let us hang out in the bridge with them for most of the trip. We had a pretty clear path. 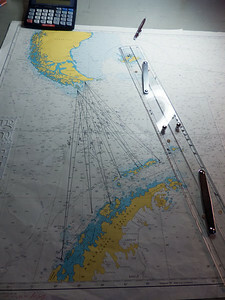 Get to the end of the Beagle Channel (point on the right), take a direct line down to The Matha Strait (bottom left) and give'r against the wind and swell. During the crossing we seemed to always have birds with us. 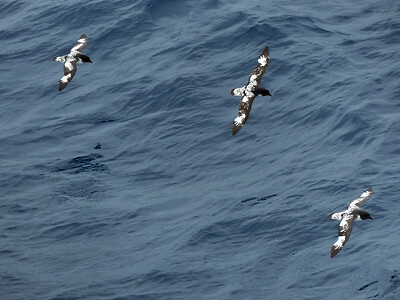 The naturalists in the bridge would call out their exact names but to the non birder they were ahem...pigeon holed into either "Petrels" or "Albatross". Okay, I could tell what these ones were. 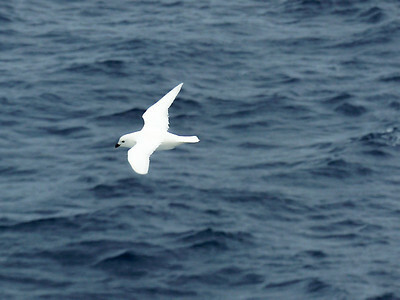 Snow petrels are pretty distinctive. 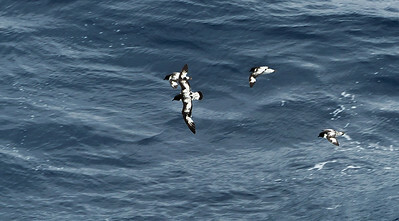 I think they were cape petrels...we nicknamed them Oreo cookie petrels as they looked black and white.